In the interest of full disclosure, I grew up with Conan the Adventurer (yes, that Conan the Adventurer) and I loved the campy little cartoon. And I only read some of the new Conan when Dark Horse got Darick Robertson to write and draw a one off issue (which is fantastic). Then Dark Horse announced that Brian Wood, writer of a fantastic viking series called Northlanders, would be writing their new launch of a Conan the Barbarian series. And five issues in, though artist Becky Cloonan has taken a break (and she was just as much a reason for me to pick up the series as Wood) I have no regrets. We have a young, brash but still deadly Conan with his pirate queen Belit in Argos. And in issue 5, Conan, Belit, and her crew have to work together to prevent Conan’s hanging and steal all kinds of riches from Argos. And there’s even a big old fight stuck right dab in the middle. It’s everything I want a Conan comic to be. 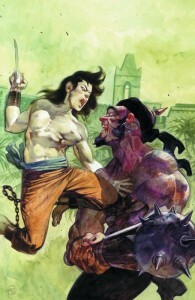 This entry was posted in JoeComicReviews and tagged brian wood, conan, dark horse by Joe. Bookmark the permalink. Yeah, his look is not right but only if you’re only exposure to Conan is the Schwarzenneger vesrion. Conan as a character is actually more what we see in the pic above. The way Howard described Conan was someone muscular but also the type on the leaner, athletic side. I think this Conan flick will be following less the Schwarzenneger vesrion and more what Howard had in mind.